It’s Week 4 of the One Room Challenge, and (pinch me!) other than having severe bed anxieties, things are moving along beautifully. Renovations at the job site are really taking shape (I love our plaid floor! phewww) and we’re starting to turn our attention to the finer details as we head into the home stretch. I’ve tried not to dwell on it, but I’ve been really stressed out about my MIA canopy bed. I’ve known from the start that I wanted a modern white canopy bed in this room. 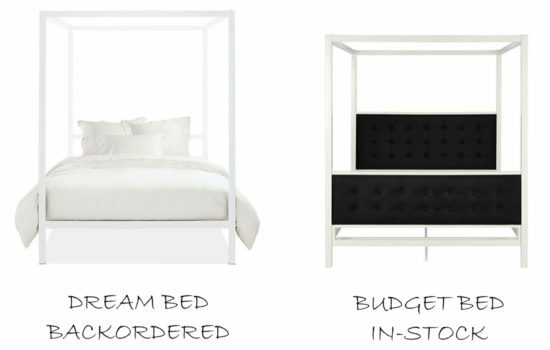 I’ve always loved the simple, clean lines of Room & Board’s architecture bed and planned to use it on this project, but when we went to order it a couple of weeks ago, the usually in-stock bed was delayed beyond Thanksgiving (well past our deadline). I searched frantically for a similar style bed that would be readily available and meet our dimension & price requirements. Total Fail – I couldn’t find a substitute, and I really struggled with where to go next. Compromise our vision and change the bed style? Wait for the architecture bed and thus have NO bed for the reveal? The idea of failing this challenge was NOT OK with me. In the end, I selected an amazing budget find from our sponsor The Mine. It’s different than the original (notably, it has a head & footboard), and it’s a little shorter. While I do have concerns about the height of the bed, our ceilings are relatively low (8′) so I think we can work with it. And the price is fantastic – it’s practically a steal. The Mine is installing it on Monday (yes they offer installation, too!) and I’m excited and honestly really nervous to see it go up. Stay tuned. . .I’m gonna give you guys my honest opinion! Last week we shared three stripe options for the bedroom wallpaper. 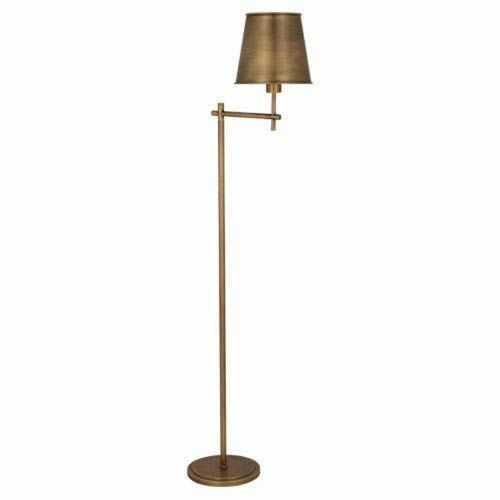 I’m over the moon that our client chose my favorite option, Schumacher’s Katsura Stripe. Truthfully I feel like I may have delicately leaned on her to choose this one. 😉 The quality was the best of all the options (it has a handmade feel of stamped paper) and it just felt like the right choice for her home. I liked the nontraditional quality to this stripe – it’s both traditional and exotic at the same time. I knew walking into a room full of this paper would transport you into a cozy, inspired, exotic retreat – exactly what a guest room should be! Knowing that this room will be enveloped in a bold wallpaper, we wanted to keep the rest of the case pieces fairly cohesive in rich, stained woods. Each of these furniture selections will play a role in achieving our vibe: “Preppy Bohemian with a British Colonial influence.” The pair of end tables with fabulous bone inlay will imbue an “Out of Africa” vibe into the room, as will the black campaign-style vintage dresser (a Chairish score), and an exquisite little hair-on-hide zebra print bench. The vintage Hickory White desk will add a neoclassical touch, and the rattan arm chair – which also came from our sponsor, The Mine – will nestle nicely into a corner and provide a natural, casual vibe that the space needs. This room has all of the elements I enjoy – modern mixed with traditional, new mixed with vintage, high end mixed with budget finds. This is my favorite way to decorate and the best way to create a collected space. We left you in suspense last week with the tile layout, but I can now reveal that we’ve chosen the more classic tile pattern (option 1), and we love how it turned out! 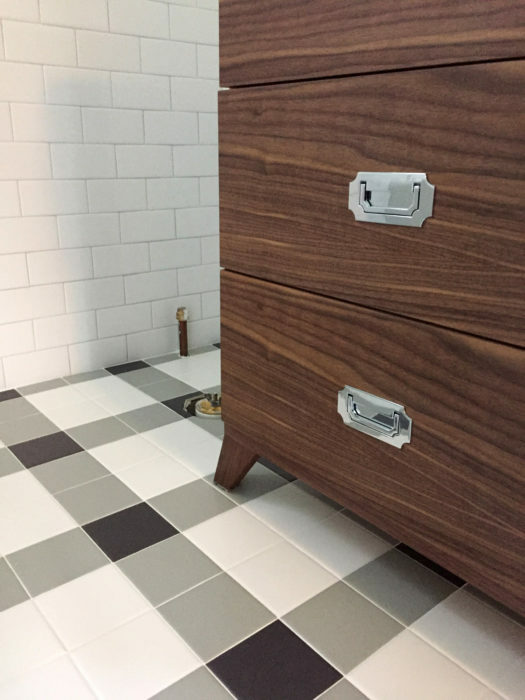 If you remember our inspiration board from Week 2, you know that we wanted to pair this plaid tile floor with a stained wood campaign-inspired vanity. That vanity has now been installed, and I’m really digging the mix of the clean preppy tile with the organic warmth of the wood. If you want more peeks of this, check our Instagram! 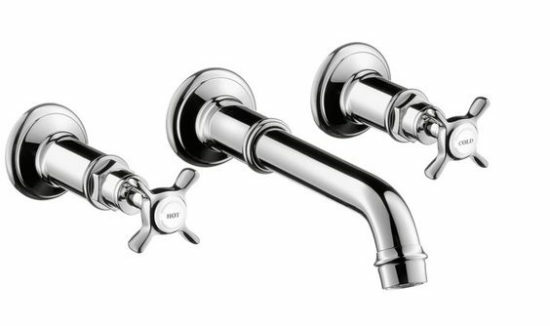 Next up is the installation of the plumbing fixtures, and I’m so excited to see these AXOR Montreux wall-mounted faucets from our sponsor Hansgrohe to be installed. I really enjoy the lines of this faucet in that it feels very traditional, but its clean lines really work in this space. While you know I’m a big fan of brass, I felt like polished chrome was a more timeless finish, and a more appropriate compliment to the plaid and the wood. The wall mount installation was really imperative here given that we did a reduced-depth vanity, as it allows us to maximize counter space and fit a standard sized sink into the vanity. We’re going to continue this AXOR Montreu collection in the shower. 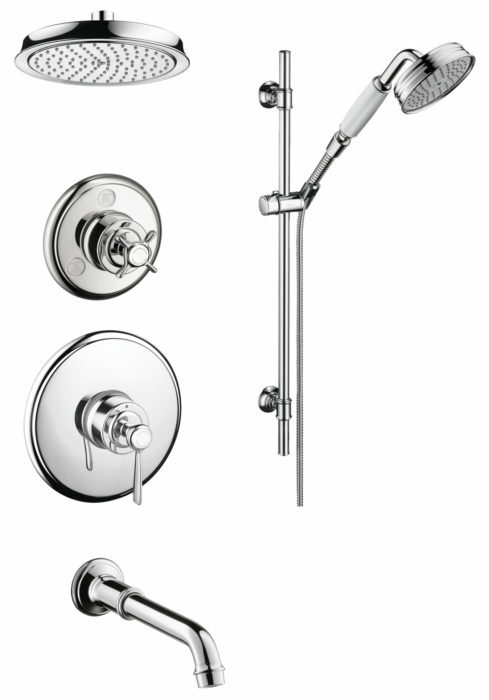 We’ll install both a stationary shower head and a secondary head on a travel bar, plus an adorable tub spout that compliments the faucet. I always love it when we can mix great function with high style in our plumbing fixtures. My dad was partial to the high quality of Hansgrohe fixtures in particular, so it feels like a small nod to him when I use them on a project. SO MUCH! It may seem like we’ve reviewed it all, but honestly there are so many details to sort out. In the bedroom, we still have to cover textiles, rugs, art, and accessories. In the bathroom, we have yet to discuss the tub, toilet, shower curtain, and finishing accessories. Wallpaper is FINALLY getting hung today, and I’m just bursting at the seams to finally see the bedroom look a little different. We’ll definitely be sharing peeks of that on Instagram in the next several days, so keep your eye out for that! Finally – a housekeeping note regarding the current One Room Challenge schedule. We’ve just been informed that the ORC will extend for an additional week, so that the new reveal date will be Nov. 15 (instead of the original Nov. 8). Sadly, this extension is in response to the recent natural disasters across many states leading up to, and during the ORC. As you can imagine, even in the most fortunate circumstances, participants in states like Texas, Florida, and California are experiencing delays and unusual challenges. Of course, our hearts are with those who are facing truly dire impacts, but as it relates to the ORC, we will be supporting each other with a one week extension on the final deadline. As an aside to those readers who are ORC Guest Participants, your reveals will now be on Nov. 16th. I think that bed could work – do you have any plans to DIY it? We MAY boost it up a bit if needed. We will see! The bathroom tile looks so good! Digging the campaign vanity, it’s the perfect fit with the modern British colonial theme! The bathroom floor is wonderful, well done. oh this is going to look so good! love that tile pattern and so totally fresh and doable too! What a difference a little creativity makes. that bed is beautiful too. not the exact one you want but that’s the fun part … you may end up liking the new option even more! The Mine came to the rescue! 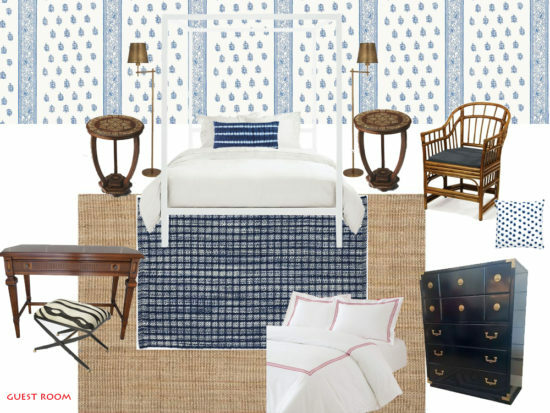 Preppy Bohemian with British Colonial vibe checks all the boxes for me! Can’t wait to see how it comes together. Tile looks great and I LOVE the paper choice.